You can now make big budget, Hollywood-style special effects at used car prices. If this is not the beginning of a revolution then I don't know what is. In Adobe's latest release of the Creative Suite product line (known as CS5) they've brought back the Ultra green screen product (which went missing in CS4) and given it so much bang for the buck that I think it could topple a small third-world nation. To begin with, the green screen product is no longer a stand-alone application, the functionality is now built right into Adobe's Premiere Pro editing package. This gives you, the filmmaker, a crazy amount of control over how your composites integrate into your scenes. 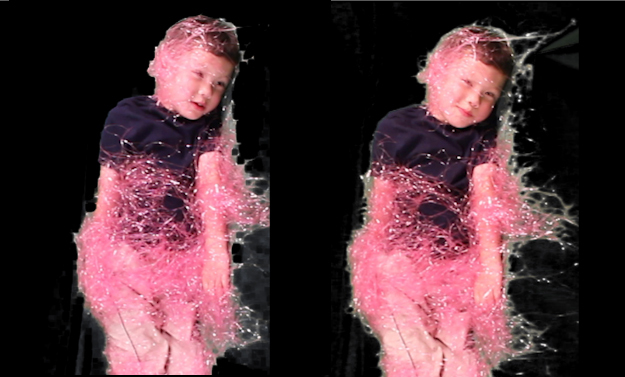 For example, you can add any other Premiere effect on top of a composite and see the results instantaneously. In the sample composite I created for this article ("The Big Spider"), I added motion to my keyed layer so that it would match the motion of the layer underneath. I was also able to shrink and grow the dimensions of my keyed layer over the length of the piece (in attempt to hide some lights at the edge of my green screen). I was able to play with each of these effects one at a time, independent of the Ultra key effect, which allowed my project to act like a big special effects sandwich. I could easily open it up, throw in a different flavor and see what the results were. This is a monumental change from Adobe's previous approach which baked the green screen effect into the footage at the outset. Another powerful feature that makes this package a "must buy" is the ability to cut and splice footage at any point in the composite. After spending a good deal of time matching the movements of my video layers I realized I needed to cut a line of dialogue. I had a rather large stack of effects built up at this point, and I wondered if this house of cards would come crashing down after taking out a small piece. I was happy to learn that not only could I cut out a few seconds of my keyed layer, but all of my effects stayed with the clip. Even better, when I stretched the clip I had new frames to work with. That is to say, if you clip out an effect and then add heads and tails to it, the heads and tails do not carry any effects history. This is extremely powerful because it allows you to play with different flavors of the effect without worrying that it will ruin your sandwich. When the layers are composited together the extra detail from the relaxed choke actually helps to sell the image. By switching back and forth between a view of the key layer and a view of the composite you can easily refine your key. Adobe could not make keying easier even if they came over to your house and sat on your sofa and said,"Why don't you play Halo on the Xbox for a while, I'll go ahead and finish this shot." Below is an image of what a big, beautiful effects sandwich looks like. On the left you can see the Ultra Key effect, intermingled with motion and crop effects. The large values for choke (set to 83) and contrast (set to 99) tell Premiere to remove anything from the image that in any way resembles the key color. In my case the "aggressive" values cleaned up the background but also removed some of the subject detail (at the transition point between subject and green screen). The power that Adobe puts in your hands is the ability to tweak these settings up until the point of perfection. With this easy-to-control, powerful effects sandwich Adobe has created a whole new world of green screen filmmaking. The rating of my PC did not change in any way, which might lead one to believe they've just wasted $800. But step inside Premiere Pro and it's a whole new world. With Creative Suite 5 the holy trinity of Adobe, Canon and Nvidia have truly ascended to the heavens. With an $800 student version of Adobe CS5, an $800 Canon Rebel T2i camera and an $800 Nvidia Quardo 3800 you too can produce Hollywood-grade video content. You don't need the studio system. You don't need an ASC cinematographer to tell you how to set up your shot. Now you just need to go out and shoot. It truly is a revolution.